Let me put this right out front. I don't like cheesecake. I don't know why, I really think it is a texture thing. It is generally so dense and other times almost fluffy like a thick mousse. If someone should order it, I'll taste, but it really is the one dessert I can walk away from. Except this month. It is the Daring Baker's Challenge. As I have reported before, this very large group of bloggers is given the challenge at the first of the month. We dwell on it secretly all month, and then as reveal date approaches, I panic because life can get crazy busy. So, for the second month in a row, I am baking the day of the reveal. My daughter is SO excited. She is the one who orders cheesecake at every restaurant. Can I compare to her high standards? Only one way to find out! The Daring Baker's gives us the recipe every month, and we generally aren't allowed to make any changes. This month the recipe is plain and we are challenged to make it unique. So I merged my favorite cheesecake recipe (yes, even a non eater like me knows what's good!) and made a Chocolate Mocha Cheesecake. My recipe is at least 18 years old. It originally came from Williams Sonoma although I doubt it is hanging out in any archives because it calls for a coffee extract called Trablit. It is a fantastic product they quit carrying around 1997. I recently found it at an L.A. store called Surfas, along with many other of my favorite Williams Sonoma discontinued items. Perhaps you can't get your hands on Trablit, or don't want the large bottle offered online, you can make your own so to speak. One option is to use instant espresso powder and dissolve in water to make a dark concentrate or use Kahlua for a more subtle flavor, but I can't say either will taste as good as the real thing. 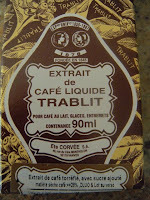 If you do go for the Trablit, try it in a little warm milk...delicious! So what follows is a merged recipe. It is delicious, even for a non cheesecake girl like me. I think part of my liking this version better than a traditional cheesecake is that this is only a pound of cream cheese, where as many are a pound and a half. I used light sour cream and I think that keeps the texture a little lighter on the tongue. The crust as an after note, could seriously be made with closer to 3 cups of grahams. I added the additional almond meal for a little "good fat", but still the crust was lower than the cheesecake batter. Line the outside of a Springform pan with foil, shiny side out. Butter the inside of the pan. Mix ingredients and press into the bottom and up the sides of Springform pan. I am using an 8" pan. Put crust in fridge while you make the cheesecake. Melt chocolate over simmering water with rum. Set aside. In bowl of electric mixer beat cream cheese until fluffy. Beat in eggs one at a time and then sour cream and sugar. Add Trablit and mix well. Divide the batter into 2 bowls. To one mixture add the chocolate/rum mixture. Layer the chocolate batter first and carefully top with the coffee only mixture. Place cheesecake pan in lager roasting pan and pour boiling water up to the halfway point of the cheesecake pan. Carefully bake for about 50 minutes. You want a little jiggle in the middle and a little more done around the edges. Turn off oven and leave cake in oven for about another hour. Remove from water bath and chill fully before serving. To serve. I make a whipped cream scented with Trablit and a little powdered sugar. Garnish with chocolate covered espresso beans. That's it! Delicious! Get in there and cook! It is no secret to my friends and family that my very most favorite thing to eat and bake is sugar cookies. Not fluffy anemic looking cookies, but flat, crisp, buttery cookies with some sort of icing. Recently we spent a weekend at a friend's lake house, and instead of bringing a hostess gift, I decided to see what they needed in the kitchen. So after a fun weekend of skiing, good food and relaxing, I bought her a few essentials she needed and baked her "thank you" cookies. These were particularly fun, no rules, I kept them colorful and interesting. I used a pastry wheel and ruler to cut my squares and rectangles, and cutters for hearts, circles, fluted rounds. Any shape works, and the variety of shapes and colors made it a stunning thank you. Earlier this spring I posted the Springtime Sugar Cookies with my first video attempt. http://sweetiepetitti.blogspot.com/2009/03/springtime-sugar-cookies.html The icing for those cookies was a little more involved with the decorating tips and the icing was more of a buttercream knock off or fluffy frosting. The other sugar cookie method of icing is the Royal Icing. Royal Icing is traditionally made with confectioner's sugar, egg white and water. Now that little egg white can churn up a big controversy. Let me just say, I am not compromised health wise, and neither is anyone in my immediate family. However, I share everything I bake, so I tend to use either Just Whites, which are a pasteurized egg product, or Meringue Powder, a product made from dried egg whites and put out by Wilton. The egg white is an integral part of Royal Icing. It lends to the sheen of the finished product and also the stability of it. The icing will dry hard as a rock so the cookies can easily be stacked. Also, the icing can be thinned to flow over the cookie. But, a word of warning, Royal Icing is very sweet, without the presence of fat there is nothing to cut that sugar. Some recipes call for a squeeze of lemon juice which does help, and meringue powder has a little citric acid in it, so it doesn't taste quite as sweet. I like many people find it to be the perfect contrast with the simple sugar cookie. But try both types of icing and decide for yourself. As stated many times on my blog, be sure to use gel paste food coloring for the most vibrant colors, use only real butter for the cookies and Nielsen Massey Vanilla in anything that calls for vanilla. If you are using white icing for your cookies, use the clear artificial vanilla from Wilton, it tastes terrible in comparison, but it gives the icing a boost. In the bowl of electric mixer, combine whites, 4 cups sugar, salt and mix until combined. Turn up power and whip about 5 minutes until fluffy. Add additional sugar and or water to get the proper consistency. To substitute pasteurized whites, follow the measurement chart on the package. To substitute meringue party, follow the manufacturer's recipe that is included for the best results. Yep, here it is. The OMG moment for many of my friends. I have a boxed cake mix baking in my oven. Gasp! There are good reasons, and the best is tradition, this is an Easter project I remember from childhood and I have tried to get my own kids to do it over the years. Could it be made from scratch? Absolutely! Does my 15 year old daughter want to bake a cake from scratch? Not really. You can't believe how hard it was for me to talk her out of canned icing!!!! Yuck!!! With a trusty box of Duncan Hines, I can pretty much let her loose in the kitchen. I also sold Duncan Hines cake mix back in the 80's when I worked for Procter and Gamble, so I can totally sell you on all of its fine qualities. Before we launch into the easy bunny cake, let's talk quick about the old fashioned cake molds and the newer versions of shaped pans at Williams Sonoma and other retailers. I can remember as a kid making the lamb. It stood in the oven as it baked, and it never, ever held together. I now know that your basic boxed cake mix is too soft to hold up to theses molds. If you are making any type of cake that stands or is molded use a pound cake, bundt cake or old fashioned homemade cake recipe. Trust me on this. So basically this fun Easter Bunny cake begins with 2 cake layers, 8,9 or 10 inch layers are fine. Bake them as directed and feel free to use any flavor. After the cakes have baked, cool in the pans for about 15 minutes and then pop them out and cool on a rack. Following the pictures, you are going to cut one of the layers to make 2 ears and a bow tie. Then you assemble the bunny using the uncut layer as his head. Here is the buttercream frosting we made. We frosted our bunny in chocolate and made the ears white and white eyes. We dyed the rest pink and filled his ears. Jelly bean eyes and tie polka dots work well. Licorice whiskers are good, but we didn't have any so I rolled out pink marshmallows and cut them in strips with a pizza cutter. Feel free to use up whatever candy or decorations you have around! Happy Easter!